Geospatial information system (GIS) technology is a crucial part of the coordination and planning process involved for tactical military missions both on land and at sea. The Navy can now rely on this technology for increased chances of success in military missions carried out by vessels on or under the water, and coordinate with forces on land or other vessels to enhance effectiveness on joint missions. Since rugged tablets have swiftly risen to the status of preferred tactical device, it is almost imperative that military-grade tablets be GIS capable, so Navy and other military personnel can obtain a better understanding regarding their environments. GIS enabled 3D mapping delivers a visual confirmation that goes beyond that of traditional map by identifying key resources and information which can be used to effectively work around any existing environmental factors as well as enemy dangers. Data access which can be kept secure and open only to authorized personnel. Between the GIS compliant software and hardware that runs multiple programs at once, data can be synced, accessed, and viewed readily on the tablet screen, and 3D mapping carried out with results transferred in real time to be analyzed and used to coordinate shipboard and ground teams. Data analysis performed on a GIS enabled tablet can provide critical information in reports about the surrounding area. The necessary processing power is present in a rugged tablet, meaning all data can be accessed and analysis utilized on the go, increasing the likelihood of mission success. Continuity is made possible by GIS technology which can continually relay updated information to surrounding vessels as well as command, providing a clear picture of the surrounding waters delivering actionable information as 3D maps delineate problem areas or highlight issues that could hamper reconnaissance, relief, or rescue operations. The scalability of tactical tablets which are equipped with GIS technology means that deployment can be accomplished in even waves, as slowly or as quickly as necessary to meet demand. As 3D mapping becomes a more commonly utilized process, technicians will need tools to support their initiatives and these purpose built devices can both meet that need and provide for an increase in operational success across multiple squadrons. GIS technology can be used in a variety of situations to gauge the safety of surrounding waters, help enhance weather reporting, and improve collaboration for a more effective response to disasters and threats on the water or on shore. Naval mobility and intelligence requires mobility and flexibility, and GIS capable devices can provide the real time information required via 3D mapping and the heightened accuracy of vital details. As rugged tablets become more and more popular with those who use GIS (geographic information systems) in the field, the reverse is also true – those who use GIS are turning to rugged tablets for the best marriage of software and hardware. Windows-based rugged tablets allow technicians and service personnel in the field to navigate urban, remote, and hazardous environments with the knowledge that their device is as rugged as the terrain. Mobile GIS support assists in rapid determinations in the field, including asset location, maintenance and management. 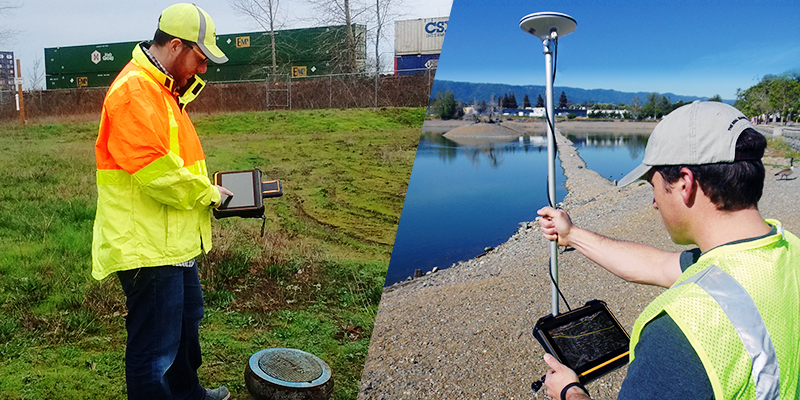 While geospatial applications have been primarily associated with traditional field service sectors, advanced positioning and mobile computing technologies as well as durable, rugged mobile devices have allowed the tech to expand across almost every global industry. Access to GIS data is streamlined and made more usable with larger screened devices, and the relative lightness and open faced design means it is easier to handle than a laptop. Why Choose Rugged over Consumer Grade Devices? Many consumer tablets simply aren’t built with either the durability or functionality required for in field use. Rugged tablets not only stand up to hard usage in the field, but the high accuracy position engine, data capture modules, GIS software integration, and additional peripherals and applications that can be implemented on a single device make the rugged tablet the top choice for those dealing with GIS in any vertical. The ability to distribute high quality, functional devices to a larger number of workers with less long term cost for upgrades or replacement of broken devices makes the rugged tablet the game changer GIS users have been looking for.